It was the first day of our very first #yarntour when we rolled up to String Theory Colorworks in Orlando, Florida. We were just a tad nervous (read: gut-wrenchingly nervous), but Caitlin greeted us with a big smile and was so warm and engaging that I started feeling better immediately. And I think I can speak for Melissa as well when I say that as soon as we stepped into the dye studio, all the nerves were replaced by sheer excitement and curiosity. If you’ve never been in a dye room, let me just tell you that each one is incredibly unique to the dyer, but they all share a sense of magic and possibility. Caitlin makes magic in the form of science and numbers, fiber and dye. Think gorgeous pics of nebula clusters from NASA, not boring equations from 10th-grade algebra. Sidebar – we had a funny convo about how we all thought we would never use 10th grade algebra in real life. It’s terrible to be so, so wrong. All you knitters/dyers/designers feel me, right?! So. Much. Math. Caitlin’s studio is filled with custom tools to help streamline her dyeing process, many of which were built by her husband. Because she’s dyeing with the intent of creating PERFECT stripes, her process is one of precision. Her colorway Rainbow Prism takes four days to dye. Four days! Why stripes? That’s actually how her dyeing journey began. Caitlin was a knitter looking for the perfect, non-big-box, self-striping yarn with really wide stripes. When she couldn’t find any, she decided she would learn to make it herself! She currently has 274 repeatable colorways and 6 different bases, with more being rotated into the mix from time to time. And, as if perfectly measured stripes in glorious colors weren’t enough, she includes a handmade stitch marker with each skein! When speaking to Caitlin you get a sense of her commitment to her customers. She keeps meticulous notes on her dye formulas and patterns, making almost every single skein she creates repeatable. Y’all know how important that is! When you see the perfect project on Ravelry and you just have to make one in that EXACT colorway…???? 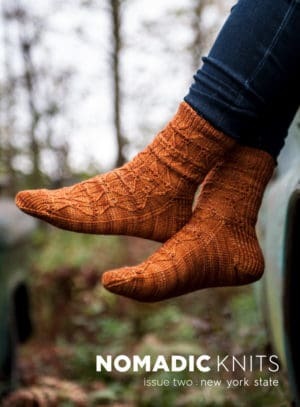 String Theory Colorworks has also been running a Sock Club since 2010 with a couple of breaks for two beautiful babies. And each time, Caitlin made sure that her club members received exactly what they had signed up for before the babies arrived! Something that really stood out for me as we were chatting away is this: People who are interested are interesting. And that is exactly how I would describe Caitlin. She is beautifully curious about the world and she shares that curiosity via her work. Look at the names of her yarns sometime. There are stories everywhere. With a background in biology, much of Caitlin’s colorways are named for things in the natural world that have caught her attention. She operates at the crossroads of science and art, and I can’t help but be entirely fascinated by that! 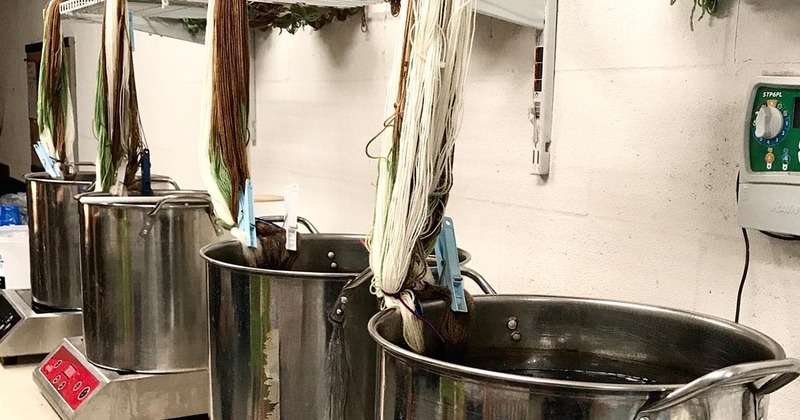 Beyond dyeing yarn, Caitlin is also a member of Florida Indie Dyers, a collective of dyers working to connect Florida fiber artists and grow a cohesive community. She is yet another amazing example of why we’re so grateful to be part of a community that is all about bringing people together! She is just wonderful – it was our pleasure! We hear that some of your creativity and curiosity for the world may have rubbed off on her. Good work, momma!